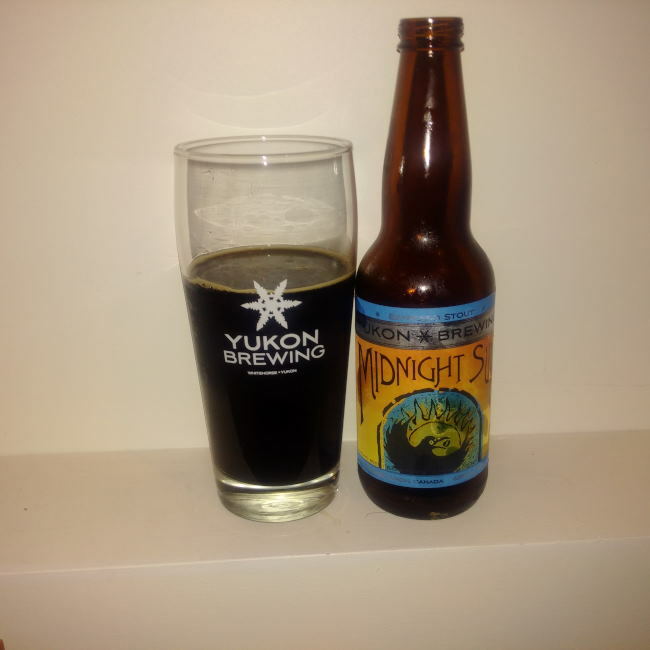 From Yukon Brewing in Whitehorse in the Yukon Territories (Northern Canada 2,400km North of Vancouver BC) comes the “Midnight Sun (Espresso Stout)”. The beer pours a very deep brown colour with a brown head. The aroma consists of espresso, creamy and some roastiness. The flavour is of burnt malts, espresso, milk chocolate, earth and bitterness. The alcohol content comes in at 6.2%. This would be a very good beer to drink on a nice freezing cold winter night in the Yukon or even on a rainy winter night in Vancouver (or any other time you feel like it). Commercial Description: In the fall of 2003, Midnight Sun Coffee Roasters, a local Whitehorse coffee company that roasts their coffee fresh here in the north, approached us with an idea. Zola Dore (the Yukon Bean Queen) was enjoying a home brewed espresso stout she was producing at a local U-brew when inspiration struck, “Let’s work together to produce this beer in bigger volumes”. Sometimes brilliance can be confused with insanity and espresso stout beer certainly lends itself to insanity, but several awards and hundreds of enthusiastic reviews later and it’s clear this creation is a winner. To say that our brew team outdid themselves is perhaps not going far enough. By the time they finished creating, we had a beer with eight different malts (that’s right, Alice, eight malts) not to mention oatmeal and, of course, espresso coffee. The result is a beer that is fine as frog’s hair, full bodied yet smooth, rich with coffee aromas and flavours without ever losing sight of the fact that it’s beer. This entry was posted in Stout and tagged bitterness, burnt malt, burnt malts, canada, earth, espresso, espresso stout, midnight sun, Midnight Sun Coffee Roasters, milk chocolate, whitehorse, yukon brewing, yukon territories.